An 8-month old cloned Boran calf named Tumaini (meaning ‘hope’ in Kiswahili), on the left, is part of a long-term ILRI research project to develop cattle for Africa that are genetically resistant to trypanosomiasis (photo credit: ILRI/Paul Karaimu). The International Livestock Research Institute (ILRI), a member of the CGIAR Consortium, is a non-profit organization based in Africa. ILRI’s mission is to use the best and safest livestock science available to confront poverty, hunger, and disease in the developing world, where livestock provide livelihoods and food for hundreds of millions of people. One of ILRI’s most important priorities today is to help poor livestock keepers in Africa deal with the constant threat of a devastating disease called trypanosomiasis. This disease is arguably Africa’s most important livestock disease, wasting and killing cattle, commonly the most important asset of poor households. The human form of the disease is called sleeping sickness, which afflicts tens of thousands of people every year, killing many of them, and putting tens of millions more people at risk. As part of ILRI’s comprehensive fight against trypanosomiasis, the institute is now in the very early stages of a project to develop disease-resistant cattle, which could save the lives of livestock and people both. Thus far, ILRI and its partners have taken a preliminary step in the process, which involved successfully cloning a male calf from one of East Africa’s most important cattle breeds, the Boran. 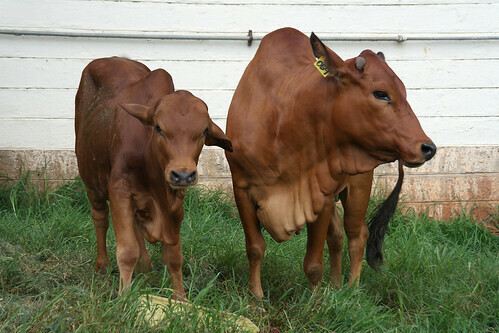 The calf is healthy and is being raised at ILRI’s research facilities in Kenya. A next step is to develop a new Boran clone modified with a gene that naturally confers resistance to the disease. This involves using a synthetic copy of a gene sequence originally identified in baboons that should protect cattle against this devastating disease. A final step will be to use these disease-resistant cattle in breeding schemes that will provide African countries with another option in their fight against trypanosomiasis. This research potentially offers a reliable, self-sustaining and cost-effective way of protecting tens of millions of African cattle against disease and untimely death, as well as dramatically reducing poverty across Africa. By reducing the reservoir of pathogens, this should also help to save thousands of human lives each year. It could take up to two decades to develop disease-resistant cattle herds for Africa. ILRI and its partners are also continuing to pursue other options for fighting trypanosomiasis, such as rationale drug treatment and integrated disease control methods. For ILRI, public safety and animal welfare are paramount; this means working with all the relevant Kenyan and international regulatory authorities to ensure that the highest bio-safety standards are always employed. In line with its commitment to transparency, ILRI places all of its research results in the public domain. ILRI is working with a team that includes scientists from New York University, along with experts from the Roslin Institute in Scotland, and Michigan State University in the USA. The fundamental research aspects of this project are being funded by the US National Science Foundation. The International Livestock Research Institute (ILRI) works with partners worldwide to enhance the roles that livestock play in food security and poverty alleviation, principally in Africa and Asia. The outcomes of these research partnerships help people in developing countries keep their farm animals alive and productive, increase and sustain their livestock and farm productivity, find profitable markets for their animal products, and reduce the risk of livestock-related diseases. ILRI is a not-for-profit institution with a staff of about 600 and, in 2012, an operating budget of about USD 60 million. A member of the CGIAR Consortium working for a food-secure future, ILRI has its headquarters in Nairobi, Kenya, a principal campus in Addis Ababa, Ethiopia, and offices in other countries in East, West and Southern Africa and in South, Southeast and East Asia. CGIAR is a global partnership that unites organizations engaged in research for a food-secure future. It is carried out by 15 centres that are members of the CGIAR Consortium and conducted in close collaboration with hundreds of partner organizations, including national and regional research institutes, civil society organizations, academia and the private sector. The CGIAR’s 8,000 scientists and staff work in the developing world to reduce rural poverty, increase food security, improve human health and nutrition, and ensure more sustainable management of natural resources. With unparalleled research infrastructure and dynamic networks across the globe, and maintaining the world’s most comprehensive collections of genetic resources, CGIAR is the only institution with a clear mandate on science and technology development for the eradication of hunger and poverty at the global level.